According to the American Optometric Association (AOA), infants should have their first comprehensive eye exam at 6 months of age. Children then should receive additional eye exams at 3 years of age and just before kindergarten or first grade at about age 5 or 6. A child who cannot see will have trouble learning. Good vision is important for child development. For school-aged children, the AOA recommends an eye exam every two years if no vision correction is required. Children who need eyeglasses or contact lenses should be examined annually or according to their eye doctor’s recommendations. It’s important for parents to make sure their children’s eyes are healthy. Approximately 80% of all learning during a child’s first 12 years comes through vision. Good eye health and vision are important to your child’s learning, and vision problems can affect their performance in school. Undetected or untreated vision problems can hinder a child’s ability to perform to his/her full potential in school. In fact, many eye diseases can impair vision or lead to vision loss, which is why it is important for people of all ages to have their eyes checked regularly. At least 10 to 15% – or 8 to 12 million – children are at risk for vision impairment. Prevention of these conditions can be easy and can help your child perform his or her best at academics and sports. If you or any member of your family have eye conditions that might be concerning, schedule an eye exam for your child today. You only have one pair of eyes, so it’s important to take care of them. Pediatric Eye Exam: Academic success starts with good vision. 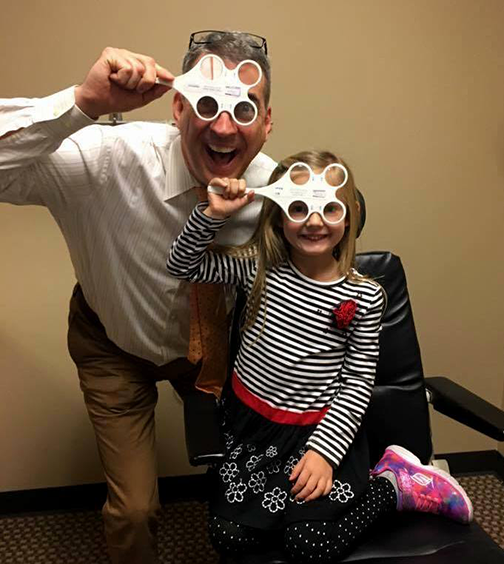 It’s important for children to have regular, comprehensive eye exams. Let Alpharetta Eye Clinic or Windward Eye Care help you and your family see the beauty all around you. Call today. Our Alpharetta offices are conveniently located for patients in North Fulton County.